"I wanted to thank you and your team for the professional, safe and dependable helicopter service provided to us on the 6th of July 2016. Please thank the Pilot and the team for transporting us safely and for waiting for us in the hot sun It was much appreciated. ". "We had a wonderful holiday in Sri Lanka. Many thanks to you, for going the extra mile on our behalf& making all formalities a smooth process". "The helicopter ride was awesome!!! Thanks for helping to arrange on such short notice.". 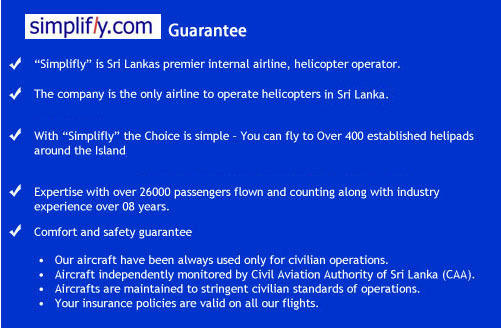 "Superb+only way to travel in Sri Lanka". "I am pleased to inform you that the visit was a great success and we feel that Simplifly provided a fantastic service and it's services were well commended by our High Commissioner Dr. Peter Hayes. The British High Commission would like to thank Simplifly for the excellent, efficient service and customer care provided. We look forward to working with Simplifly Aviation in the future". "We wish to thank you and the crew involved in the transportation of our VIP delegates to Arugam Bay. Your excellent and efficient service is greatly appreciated. We also appreciate your constant updates on all your logistical arrangements from the time the reservations were made until the travellers returned. Thanks once again for your excellent service". "This was my first helicopter ride and it was fantastic! Can’t wait to do it again! How amazing! Thanks for giving me the opportunity!" "Absolutely amazing experience! Smooth take off and landing. I would definitely recommend Deccan"
"Thank you for an excellent experience! The opportunity to have seen Sri Lanka, its coast and inland from such an advantageous point was superb!" "Excellent! A chance to see Sri Lanka from the air at a reasonable height. Next time would like a longer ride! J"
"Will definitely suggest to future guests!" Mr. Lakmal Perera (Head of Sales, Simplifly) was very helpful and patient in his assistance to us! He is a credit to your company!" "Dear Jean-Marc, thank you so much for arranging the heli ride today. It was amazing and so quick! I will definitely recommend it and include as an option. Wish I had more time to see more but it gives me an excuse to return!" "The aerial shots for the programme that we shot in Sri Lanka in October look wonderful. Thank you for accommodating us"
"Thank you very much, it was a pleasure flying with you. The trip was relaxing and truly enjoyable"
"I was met at the gate as I descended from my international flight. From that moment, until my arrival at my destination, the service was excellent"
what we needed to complete our trip to Sri Lanka"
"All went extremely well. Thanks again. Will recommend Simplifly to all my clients and principles as well. Best regards"
"The personal touch and flexibility made every minute of our time more memorable and exciting, for which we're very thankful"
"Whatever you are doing, don't change it!"